The Ninja Mug from Thumbs Up! is another fun novelty mug. However, unlike the companies recently released Robocup, the Ninja Mug is pretty much your standard rounded mug. The design is pretty simple. It's black with two white eyes, the fun comes when you use the add-on items. Here we have a black cloth cover that you can velcro to the mug. 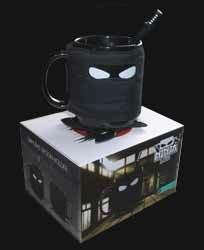 This is both practice, as it insulates the mug and helps to slow the cooling of your hot beverage, but it's also decorative as it has a slit in it to allow the Ninja eyes to peek through. There's also a throwing star shaped coaster and spoon with a handle designed to look like a sword handle. There is a slight problem though and one that should have fixed before the item was released. The base of the coaster has a coating that ensures it won't slip on the surface you place it on. However, putting a glazed mug onto a glazed coaster wasn't the best thought through idea, as the cup can (and does) easily slide off. Go to pick up the mug and knock it by accident and you'll end up with boiling water everywhere. If you ignore that slight issue then you'll get a real kick out of this novelty item.